Our youth has many dreams and aspirations. Lots of young boys dream of scoring the winning goal in the Champions League final or win the World Cup with their country. Their dream: being a professional football player. In football only a few children become a professional football player. So talent recognition, especially in the youth departments, is a very important but delicate aspect. In generating professional football players, does it make sense to identify and select children for our academies at a very young age? Nowadays most professional football clubs start the area of talent recognition, called “scouting”, at children aged 7 years old. Smart play to be there first or ridiculous? Why do children play sports? Let’s start off with determining the reasons why young children play sports, first. In a report by The New York Times the results showed that most children (girls: 98%, boys: 95%) play sports for the fun of it (1). Children who think their parents value winning, have higher scores on a checklist for burnout (2). Together with my experiences in youth football children do want to win, obviously. What they want even more is to play and to have fun on the pitch. Can we relate to that? Whether we can or not, the results are clear: children play sports mainly for the fun of it. Within these children lots of them want to become a professional football player (or athlete) as well. Children who want to become a professional athlete have a long way to follow. To keep following this path (and have success) it’s essential to have developed a love for the sport (3). Having fun in playing is very important in developing such a love. If you ever get the chance to talk with (ex) professional football players or athletes ask them what the most important thing is to become a professional player! In my experience, the likes of Van Nistelrooy and Koevermans answered like the children in the New York Times report. How many children become a professional football player? Children want to play and have fun and most children would like to become a professional football player. What are the odds of becoming one? The NCAA in the United States have done research on the chances of becoming a professional athlete. The NCAA is the world’s largest organization in the field of college and university sports tournaments. They organize tournaments in baseball, basketball, ice hockey, American football, soccer (here after: football). Often such a tournament is the last step before a career in the MLB, NBA, NHL, NFL or MLS. In the United States children get selected for college teams and are regarded as the best among their peers. So if you’re participating on such a tournament, what odds do you have to make the step into a professional career? Not very good! In football, the chance of becoming a professional football player is no more than 1.4%. The NCAA concluded: “Professional opportunities are extremely limited and the likelihood of a high school or even college athlete becoming a professional athlete is very low” (4). Alright, that’s the United States. Football is not one of the most popular sports over there. So what about children in a football minded country like the Netherlands? In the Netherlands 38 professional football clubs exist. Let’s say they have an average squad size of 16 players (on contract). That means (38×16) 608 spots for our children to become a professional football player. There’s over 500.000 registered children distributed in 7 age groups playing football (5). When focusing on only one age group, the U11’s, there’s 93,310 children playing football. If they’d all want to be a professional football player at age 18, and as by a miracle all the Dutch professional football clubs in the Netherlands need to fill their complete squad at that very moment with Dutch players aged 18, then these U11 children have a (608/93310) .006% chance of becoming a professional football player. As said there’s 38 professional Dutch football clubs, what about the chances if one makes it to play in such an academy? In 2011 Elsevier (Dutch magazine) did research on this topic, their results: 4.5% of the children in a professional Dutch youth academy will reach professional football. 4.5%! What about chances if you’re an English football player? Researchers in England have studied chances of English children in 2012. They’ve collected data on players in the U16-U18 teams from professional English football academies and found that, sit tight, of those selected children in the professional youth academy from U16-U18 99% did not become a professional football player! So only 1% of the players, playing within a professional youth academy in a U16-U18 team, progresses towards professional football. 1% makes it! (6). Conclusively the odds of becoming a professional football player are low, very low. Alright, children play sports mainly for the fun of it. And lots of these children want to become a professional football player (or athlete), however only a few will make it through the academies. Therefore it seems legitimate to search for and ‘recognize’ those few players. Besides, for various reasons (one being money), we can not give every child a spot in a professional youth academy, so we have to select children. How do we do that? There’s a football match going on and on the sideline men, called scouts, appointed by professional football clubs are scanning the football pitches for young talented players. So these scouts write down the names of the boys who are talented – at least in their eyes. A couple of weeks later these children receive an invitation to have some training sessions with the club the scout was working for. Thus at a very young age children get ‘separated’ and ‘divided’ in two groups: one group labeled talented and another group labeled not talented. As a consequence those deemed talented get the chance to develop themselves within a professional football club – surrounded with people whose job it is to develop the children. The young football players labeled as not having (enough) talent are most of the time rendered to parents who try their best. Some psychologists will call this phenomenon: self-fulfilling prophecy. After all the young children in who we believe are awarded with better opportunities, have a greater chance to develop and consequently our beliefs at the beginning are (made) right. But were we truly right in the beginning? Did we select the really talented players? Based upon numbers of boys being released and replaced in academies (11) maybe we were and did not. How do you spot talent? When looking at the odds of becoming a professional football player, it seems to make sense to have a desire to recognize those players who have the talent to make it as a professional football player nearly a decade later. After all, you want those few players (4.5% of all children) that will later make it at your club now, in your academy, of course. Before zooming in on what to look for, let’s rule out one possible explanation on why that few children progress through the academies to make it as a pro. Cause it could be that the wrong children are playing football, and therefore not even 5% will progress. Maybe the children that have talent to play football are not playing football? Let’s bring some more stats in. In 2015 93,310 children aged 10 & 11 were registered with the KNVB, the Dutch FA, as football player. In 2015 there were 202,028 children aged 10 & 11 in the Netherlands (7). This means that almost half of Dutch children (boys) aged 10 & 11 were playing football, 46.18% to be precise. More or less the same percentage is found with the U9, U13, & U15 age groups up until the U17 age group. At the U17’s, the percentage of boys playing football falls to 35.91% (still one third!) and descends even more at U19 (27% – still 1 in 4!). Therefore the explanation that the wrong children are playing football in the Netherlands seems to be rubbish. Nearly half of Dutch boys play football from 8 until 15 years of age. If a Dutch boy is not at home, try the local football club! Consequently the pond of children to fish from in the Netherlands is good. So when that few children, 4.5%, breakthrough as a professional football player it makes sense to select the most talented children for one’s academy. Then what is the talent scout at the sideline looking for on the pitch? The best player! That makes sense on multiple levels. For one, taking into account what level of skill/play a football club needs at their first team level, the children who are the furthest in their development (the best) are closest to that level. On another level selecting the best player makes sense because he can win matches for your club. In the end football is a game with the goal to win. On a last level, you can’t expect much more from a scout who’s attending one match. On that very moment, the scout can’t detect more than the level of skill of the various boys. Nobody can. Then why write a piece on talent recognition? Because, in my eyes, the system is completely wrong! Recognizing and rearing talent is more than selecting the best player. Talent recognition is hard, very paradoxical and (almost) undoable from the sideline. If the way to recognize talent is identifying the best player at the moment you’re watching, there wouldn’t be so much to it. Then scouting would not be interesting, it would be very boring and everyone could sign up for that job. Most people can select one to three players who have the most influence on the match result. Some of these players may very well be truly talented and are the right picks, but from research we know that being the best football player at a youth age is not a guarantee at all for being the best in a couple of years (8), when you should be the best as an adult football player. If one believes that the best players should be selected, then this person holds the belief that development is a linear process. The best will always be the best. But this is, we know through lots of research, not true. Development is unclear and goes with highs and lows. What about the reason to recognize the best player on the pitch because this player is closest to the level a club aspires to play with their first squad? In answering this question we’ll take another perspective in which developing a professional football player is a process with three stages: input -> development -> output. The easiest part to define is output. The output is the level of play of the first squad of a football club. The first team has to win matches (in my opinion the only squad in a club that should) and therefore it needs players with a certain (minimum) level of qualities. The output is the skill level you need in order to be part of the team as an adult football player at a specific football club. So for example, the output level for Manchester City is higher than for Leyton Orient. The logical step to see which players are close or closest to that level is to compare their actual level of play, their development, to the desired output (level of play needed als an adult). An analogy: two men are running 10 miles. Hence, the finish line is at 10 miles, that’s the output level. Albert who is at 9 miles is closer to the finish line, than Richard at 6.5 miles. Based upon this information we can say that Albert is further in his development on completing the 10 miles than Richard. Albert is better at running 10 miles than Richard. Right? This is what happens a lot at football clubs; comparing output level to actual development of players and comparing development of players with each other. Reasoning like this, it makes total sense to select those players who are the furthest in their development, who are the best players on the pitch. Next to the paradox that being the best is no guarantee for later succes (8) another arises when thinking a step further: how did that child become this good? How come that Albert has already run 9 miles, whilst Richard is at 6.5 miles? Did they start at the same time? Or has Albert been running for 1 hour already whilst Richard has just been out there for 30 minutes? In football we have not been able to steer in another direction, yet. Exhibit: Relative Age Effect. In the Netherlands most children in professional youth academies are born in the first half of the year (January to June). Wow, do children born in those months have more talent than their peers born in July to December? Of course not! Van Persie (August 6th), Lewandowski (August 21st), Zlatan (October 3rd), Wijnaldum (November 11th), & Mbappé (December 20th) were all born in the second half of the year. Perhaps this overrepresentation is the result of birth differences per month in the Netherlands? No! Birth rates per month fluctuate around 14,000 live born children per month – at least in 2016 and 2017 (9). Then how come children born in the first six months (January through June) are overrepresented in our professional youth academies? Because they’ve had more time (and opportunities) to develop themselves than their peers born in the second half of the year (July through December)! 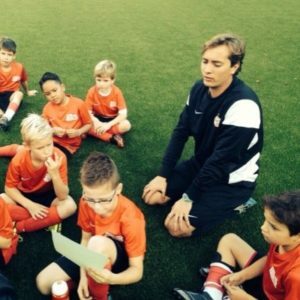 In the Netherlands children are playing in a league based upon their year of birth. The date of issue is January 1st. So a child born on January 1st 2006 plays within the same league as a child born on December 31st 2006. The January born child is fortunate because he, quite literally, has had 1 year more to develop himself than the child born on December 31st 2006. Hard to imagine? Try this. Which child do you think is furthest in his development on January 1st 2007? This doesn’t mean that children born in January can’t be talented and we should be focussing on children born on December. Kroos (4), Robben (21) & Suarez (24) were all born in January. It tells us that we shouldn’t compare children with each other! So the actual level of play of a child tells us little about the chances of becoming pro, it has no or little predictive value. Using mathematics: the development we see at time X only tells us how good one is at moment X. It doesn’t tell us how one became that good at moment X. What led to X? It won’t tell us either how good this player will be at X+5 years or X+10 years. That’s the challenging part. So what are the factors that determine how someone developed himself? What are the factors that might foretell us a little bit about the chances of a child becoming a professional football player, achieving his dream? In answering this, we need to have a look at the input phase. To me the most interesting part! The input phase is the catalyst of development. One factor influencing development is ‘starters luck’. It could be that the best player on the pitch, the one furthest in his development, is the best player because he has ‘starters luck’. Whenever we do something for the first time, there’s great variety in quality of performance. Some are very good right away, whereas others have trouble and struggle. The ‘starters luck’ could have something to do with our genes. Frankly, I am not aware of studies that link genes to better sport performances or abilities, but genes do play a role in building our character, behavior and performances. Although we know little about genes and we can’t influence them it is part of the input phase, the catalyst of development. The input phase tells us more about how good someone became, and is also part of the formula how much better one can become. A study in 2015 by Noble et al. made this very clear. They compared brains of children from different backgrounds: either grown up in a rich family or grown up in a poor family. At age 11 the children reared in a poor family had a brain which was 5% smaller than that of their peers growing up in a rich family. The ‘funny’ fact here is that their brains were also compared when they were 5 years old. Back then no differences between their brains existed! The differences emerged because of the more opportunities the rich children have had. This video (10) connects to this point. The experiences also are an explanation why in the Netherlands most players who become a professional football player have been playing in a professional Dutch academy. Only a few, the exceptions, progressed as a pro coming from an amateur football club. The quality of training sessions, the opportunities to learn at a professional youth academy are better because the children are surrounded with people who’s (fulltime) job it is to make the children better as a football player. Whereas at amateur clubs, children often don’t get training sessions given by people who’s (fulltime) job it is to make these children better football players. These children are lucky if the good meaning parent – oft their coach – is on time for the training session after a day of hard work! Experiences are vital to development! The last factor of the input phase is at least as important as the prior two: the ability to learn. All the skills regarding learning you can think of are part of this learning ability, for example self-reflection or intrinsic motivation. The better able a child is to process new information and learn from this, the greater the chances that he will become a better football player in the future. And even if the child is very able in learning and is given the best (learning) opportunities, it still is a very long and narrow way to become a professional football player! Having a fantastic learning ability and the best (learning) experiences are no guarantee to become a professional football player. It can only raise the odds for a child to progress through the academy, become a pro and achieve the dream. Therefore being a talent scout is a very unthankful job; it almost can’t be done! Some realizations to conclude: 1. Children play sports mostly to have fun (1). 2. Although lots of children want to, only a handful of children will become a professional football player (4, 6). 3. We can’t foresee which children will become a professional football player – being the best in the youth is no guarantee whatsoever (8). 4. The better able a child is to learn, the greater his chances to become a better football player. Scouting thus is a very difficult job and hardly impossible. With these realizations in mind there’s plenty of ground to improve within our talent recognition and development programs in both professional and amateur level football clubs, I reckon. These realizations tell us we can’t predict the future, so let’s don’t! Let’s not write a group of (very) young children off as not talented and making this assumption right by giving them lesser opportunities to develop themselves. Why don’t we enlarge the group of children that get training sessions with people who’s (fulltime) job it is to develop children? Iceland could be an example (12)!Let’s not define talent as being the best compared to peers, but focus on the ability to learn – the catalyst of development! 3. Gould, D. & Carson, S. "Fun and Games? Myths Surrounding the Role of Youth Sports in Developing Olympic Champions." Youth Studies Australia 23, no.1 (2004): 27-34. 8. Ostojic, S.M., Castagna, C., Calleja-Gonzalez, J., Jukic, I., Idrizovic, K., & Stojanovic, M. The Biological Age of 14-year-old Boys and Success in Adult Soccer: Do Early Maturers Predominate in the Top-level Game? Research in Sports Medicine, Vol 22, 2014.